In this article we explore GDI+ drawing operations implementing opacity, also known as alpha blending. 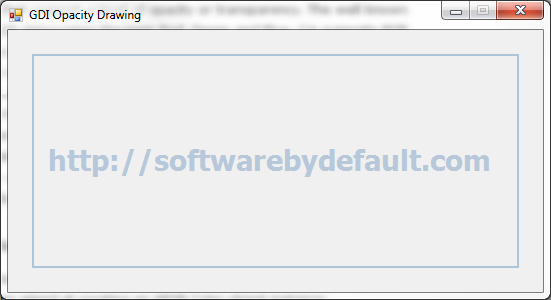 The screenshot illustrates drawing text and a rectangle onto a Windows Form in Color.SteelBlue with an alpha component of 100. In C# it is possible and relatively easy to draw text and two dimensional shapes in GDI+ that support a level of opacity or transparency. The well known abbreviation RGB abbreviates the term Red, Green and Blue. C# supports RGB colours but also what is known as ARGB colours. In the case of ARGB the A abbreviates the word Alpha, in other words an RGB colour with a specified alpha component. An alpha component specifies a colour’s opacity or transparency. Possible values range from 0 to 255 inclusive, where 0 would represent full transparency and 255 no level of transparency. If a byte consists of 8 bits and an ARGB colour is composed of 4 components ranging from 0 to 255 each representing a byte or 8 bits, then an ARGB colour is therefore a 32 bit colour. In the paint event handler an instance of the Color structure is created implementing an alpha component defined by the form’s member variable. The Color object declaration is followed by an ARGB Color Pen and SolidBrush declaration. Next the code determines the X and Y coordinates that would result in drawing the Form’s string member variable in the middle of the Form, after which the actual drawing occurs. Using the Pen object declared earlier a rectangle is drawn 25 pixels inside the form’s ClientRectangle.